RealCorp is delighted to have helped Nexa Resources SA lease about 505 sqm of ground floor offices in Luxembourg. 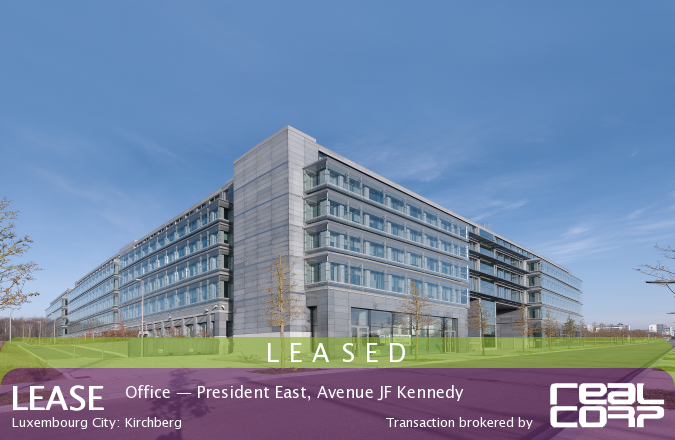 Many businesses find these President East offices on Avenue JF Kennedy very desirable. Certainly, the prestigious President complex in Kirchberg is ultra-convenient for Luxembourg City, as well as for airport and highway connections. Nexa Resources S.A., through its subsidiaries, engages in zinc mining and smelting in Latin America. It also produces copper, lead, silver and gold deposits Bloomberg. Contact RealCorp for more information on (+352) 26 27 29.